The exterior of the Russian Shop in Broker, Liberty City in Grand Theft Auto IV. The Russian Shop is a clothing store in Grand Theft Auto IV on Mohawk Avenue in Hove Beach, Broker, just down the road from the first safehouse in Liberty City. While referred by game as the "Russian Shop", the store's sign, written in Russian, reads "НОВИНКИ ПОСЛЕДНЕИ МОДЫ" (Latest Fashion Novelties). It is one of only three clothing chains where the player can purchase clothes in GTA IV, the other two being Modo and Perseus. The Russian shop is the first clothing store opened and is accessible from the start of the game. However, the clothing blip on the radar only appears after visiting the store. The store features cheap street clothes and is the only store in Liberty City that sells sunglasses and hats. It is the cheapest of the three clothing stores, with prices ranging from $8 to $36. Most of the clothing sold there has in-fact been imported from Eastern Europe as portions of Niko's original outfit can be re-purchased here. The phone number on the sign does not work on Niko's cell phone, it just has a long "beep". The Russian Shop is relatively small. Many words around the store are in Russian due to the heavy Russian population and influence in the area. The words "продажа" ("sale" in Russian) appear on the storefront. There is one cashier; she is always a Russian woman. The Russian Shop cannot be robbed, instead pressing the Use button will cause Niko to pick up a soda can/projectile from the desk beside the cash register. Killing the cashier will rarely induce a wanted level, however the thugs and gang members "hanging out" outside the store will quickly draw a firearm and open fire at Niko as he exits the store. 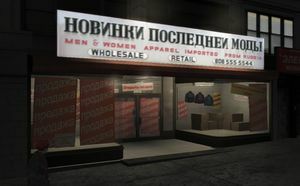 For a comprehensive list of clothing available from the Russian Shop in GTA IV, see /Clothing in GTA IV. The Russian shop is the only store of the three in Liberty City wherein hats or sunglasses may be purchased. The Russian shop was originally intended to be a Binco outlet but was changed for an unknown reason. The Russian Shop, along with Modo and Perseus cannot be entered in The Lost And Damned, The Ballad of Gay Tony or Grand Theft Auto: Chinatown Wars. Although the shop is inaccessible in The Lost and Damned, a clothes icon will appear on the map if the player walks into the locked doors. If the player wears the Spyde track top in navy and orders food from The 69th Street Diner in GTA IV, the cashier will mention that the player looks famous. This is suggesting that he resembles Sasha from "Behind Enemy Lines". An unused Spyde jacket design similar to the navy Spyde jacket but featuring racing stripes across and a red collar can be hung on the wall in the store. The Russian Shop is a very good place to start a massacre and achieve the "One Man Army" achievement/trophy early in the game. To do this, the player has to kill lots of people (outside and inside the Russian Shop). Once the player has reached 6 stars, hide inside the changing cubicles at the back of the Russian Shop. If cops come inside the store, just come out of the cubicles and kill them. You should have a new achievement. Also, provided that the mission "The Master and the Molotov" has not been completed, shortly after the player earns the achievement, the player can simply drive to the Broker Safehouse a short distance away and save their game, restoring their health and eliminating the wanted level. The same method above can be used to earn lots of money, weapons and ammunition if the player wishes or needs to, except that once the player runs out of people to murder, or their health runs low, they must immediately flee and lose the wanted level or they risk getting Wasted or Busted (and lose the money that they worked hard to earn, and, in the case of being busted, weapons, armor and ammunition). A billboard texture extracted from GTA IV game files, depicting a Binco store in the same location as the present Russian Shop. The same Binco store from GTA IV's second trailer. This page was last modified on 16 May 2014, at 14:00.